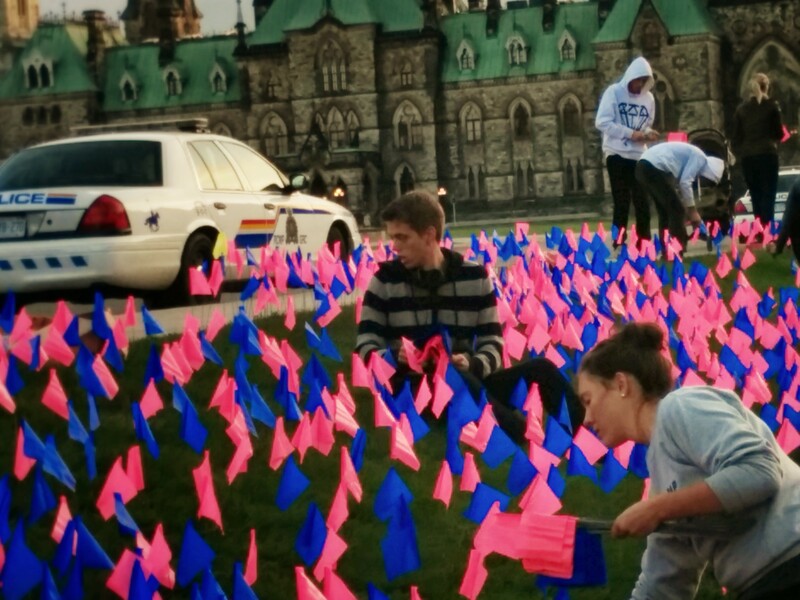 This morning, members of uOttawa Students for Life joined almost one hundred other volunteers from We Need A Law to plant 100,000 blue and pink flags on Parliament Hill. 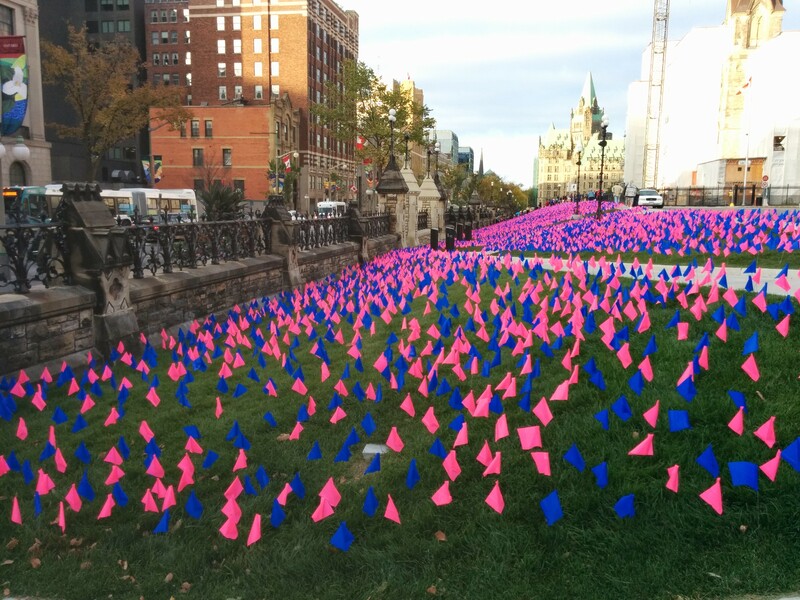 Each of these flags represents one of the 100,000 children killed by abortion in Canada every year since the Morgentaler decision in 1988. The children represented by these flags were not much loved in life, and have rarely been remembered in death, except perhaps by their mothers and fathers, many of whom grieve by the loss of their children to abortion. But for most of us, these children’s lives ended so soon after they began that their deaths passed us by unnoticed and largely uncared for. Today we took a stand to remember these children and to witness to the injustice committed against them. These children will never laugh or cry. They were never read a book or watch a play. They will never see a sunset. And they will never feel the embrace of the one they love. They were killed before any of that. They are victims of our individualist and consumer culture, as are their parents. But they will not go unremembered, at least not while we have anything to say about it. Because we are pro-life. We want the unwanted. We defend the defenceless. And we witness to the beauty, the power, and the meaning of every single human life from conception till natural death. This entry was posted in abortion, inspirational, uOSFL and tagged abortion, abortion politics, activism, advocacy, by Kelden, news, Ottawa, public opinion, right to life, uOttawa on October 2, 2014 by uOttawa Students For Life. Parliament may not want to discuss the hot topic of when life begins, but we do! 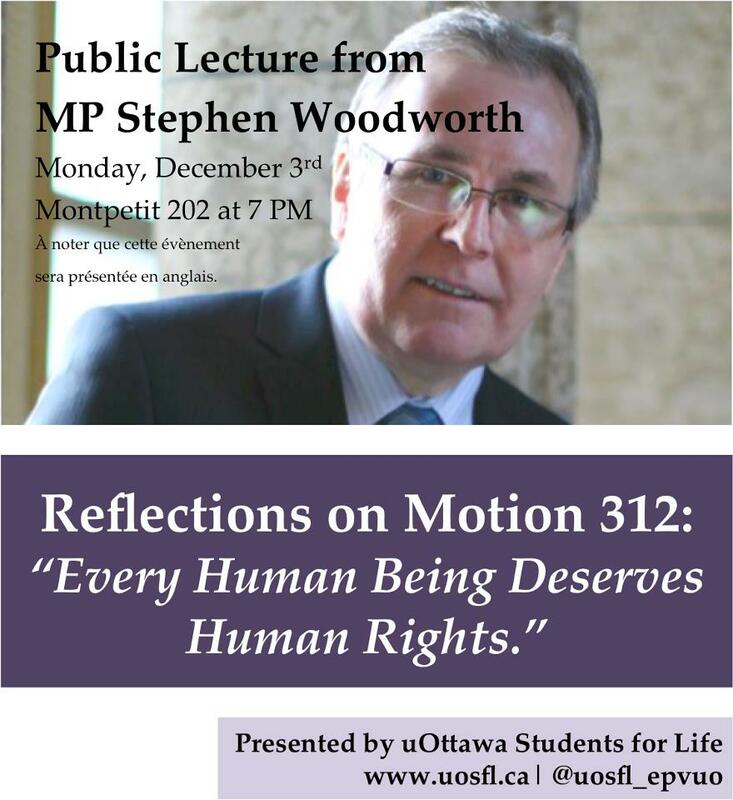 Come join us on Monday, December 3rd at 7 PM in Montpetit 202 (125 University Private) to welcome MP Stephen Woodworth to the University of Ottawa for a public lecture and discussion. For those who may not know, MP Stephen Woodworth’s Motion 312 was recently voted down in Parliament. This motion proposed that the House of Commons establish a committee to examine the scientific evidence as to when human life begins, and to report back as to the human rights implications of its findings. You can find details of this motion here: http://www.stephenwoodworth.ca/canadas-400-year-old-definition-of-human-being/motion-312This event is hosted by the University of Ottawa Students for Life, your pro-life club on campus. For more information, please see our Facebook event and follow us on Twitter at @uosfl_epvuo. This entry was posted in activism, events, legal issues and tagged biology, Motion 312, Ottawa, politics, public opinion, Stephen Woodworth, University of Ottawa on November 20, 2012 by uOttawa Students For Life. First Place OPTIONS is holding its 20th Anniversary Dinner & Auction this Friday, October 19th, from 6pm to 10pm. Our club supports this pregnancy resource centre every year through our December baby shower. Life Canada‘s National Pro-Life Conference is October 25-27 and takes place not in Ottawa but in Toronto. Kathleen Gray of the Centre for Reproductive Loss will be at Saint Paul University on Saturday, November 3rd in Room 102 (through the main doors, up the stairs, and straight down the hall to your left) for a training session from 9:30-10:30am and Q&A from 10:30-11:30am, regarding the Healing Process Model © for use by counselors, clergy, etc. in acknowledging and compassionately addressing the emotional, spiritual, and psychological distress of individuals and families affected by such loss as miscarriage, stillbirth, abortion, adoption, SIDS, infertility, and sterility. On the evening of November 3, Action Life has a fundraiser with Brian Lilley called Changing the Culture by Changing Hearts and Minds at St. Maurice Parish (4 Perry Street). Cocktails are at 6:30pm, the lasagna dinner is at 7pm and the cost is $35. The 40 Days for Life campaign continues until November 4th. A Rachel’s Vineyard retreat weekend will be held in Ottawa the weekend of November 9-11 to offer non-judgmental post-abortion healing for women and men. A Wine and Chocolate Tasting Event to benefit Campaign Life Coalition and the Miriam Centre will be held on Sunday, November 18 from 2pm to 5pm at St. Francis Xavier High School (3740 Spratt Road). The event will be hosted by Nick Vandergradt from CFRA and Stephen Woodworth will be the guest speaker. Also in Toronto rather than Ottawa, the deVeber Institute‘s Annual Dinner and Public Lecture will be on November 22 at 7pm. Margaret Somerville will speak on The Deadly Debate: Physician-Assisted Suicide on Trial at the University of Toronto. Email bioethics@deveber.org for more info and to RSVP for this free event. This entry was posted in abortion, events, for your information and tagged 40 Days for Life, abortion, Action Life, Centre for Reproductive Loss, First Place Options, healing after abortion, Kathleen Gray, Ottawa, Project Rachel, Rachel's Vineyard Retreat, Saint Paul University on October 16, 2012 by uOttawa Students For Life. After Motion 312, What Now? Wondering what to do now that the vote on Motion 312 is over? First, see how your MP voted and send an email thanking them or expressing your disappointment. Next, take a moment to support Rona Ambrose, Canada’s Minister for the Status of Women, who has been getting quite a bit of flack for having an open mind and supporting M312. Add your name to the petition supporting Minister Ambrose and send off a quick email to the PM to let him know you stand behind her. Remember, the defeat of Motion 312 is not the end, just the beginning! Canadians are tuning into the debate, so keep making your voice heard. This entry was posted in abortion, activism, for your information and tagged abortion politics, activism, Motion 312, Ottawa, Rona Ambrose, Status of Women on October 5, 2012 by uOttawa Students For Life. A week from today, on July 2nd, the Canadian Centre for Bio-Ethical Reform’s New Abortion Caravan will be in Ottawa for the last stage of its cross-country trip. Stephanie Gray and Jonathan Van Maren will be giving a talk from 7:30pm – 9:15pm titled “Abortion: How we will EndtheKilling in our Lifetime” at Greenbelt Baptist Church, 839 Shefford Rd. All are welcome at this event that is sure to be highly informative and inspiring! This entry was posted in abortion, abortion images, activism, events and tagged 2012, abortion, activism, Canadian Centre for Bio-Ethical Reform, CCBR, July 2, New Abortion Caravan, Ottawa, Stephanie Gray on June 25, 2012 by uOttawa Students For Life. The voices of women who have had abortions are resoundingly clear – “abortion hurts women.” One woman, Sabrina, said, “My life just started spiraling down in destruction, and I attempted suicide three times.” Another, Shelly, said, “Abortion did not end my pain; it began it.” Now men are even coming forward saying, “We regret lost fatherhood through abortion.” One man, Scott, said, “I didn’t defend the life of my own daughter. Based on misinformation, selfishness, fear, shame, I let her die to an abortionist’s knife and I died the same day.” The list of negative emotional, physical, psychological, and spiritual effects of abortion is hauntingly grave and long. Just as every community, big and small, has women who are experiencing or will experience an unplanned pregnancy and need alternatives to abortion, so too every community has women and men, families, who are suffering from the effects of an abortion and need healing. The fear, the pain, the confusion, as well as the need for guidance, help, and compassion are real and present in each of these situations and in each of these people. It should be a priority of every community, therefore, in striving to meet the needs of others in their community, to do what they can, by offering resources, compassionate care, and social action, to bring about an end to abortion, give help to those experiencing an unplanned pregnancy, and extend healing, forgiveness, and mercy to those suffering from the wounds of abortion. Abortion hurts everyone and helps no one, which is why we can and should join together in making it unnecessary, unthinkable, and unused as an option for anyone in any circumstance. Women deserve better than abortion. Men deserve better than abortion. Every member of the human family deserves better than abortion. Will we help those in need? For opportunities for confidential care and healing, please go to http://www.newwine.ca/post-abortion-healing-recovery.htm or PROJECT RACHEL: Post-abortion healing and reconciliation. Project Rachel is a sensitive, private and confidential experience; it is for women or men who have been hurt by an abortion. Info: 416-629-8264; info@stmarysrefuge.org. All calls/emails are private and confidential. This entry was posted in abortion, guest blogger and tagged abortion, healing, Ottawa, Rachel's Vineyard, Silent No More on June 9, 2012 by uOttawa Students For Life.